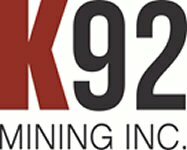 K92 Mining Inc. ("K92") (TSX VENTURE:KNT) is pleased to announce results from the first six exploration holes completed as part of the initial exploration drilling program on the Judd Vein System, at its high grade Kainantu Gold Mine. The results have shown that the Judd vein system extends at least 2,000m from previously drilled holes at Judd, which were drilled adjacent to the Kora Deposit. The previous holes drilled adjacent to Kora included 9m @ 8.8 g/t Au and 1.1% Cu and 3m @ 278 g/t Au. The Judd Vein System is located within the ML 150 mining lease and runs parallel to the Irumafimpa - Kora Vein System. It is also parallel to, and between 50 and 100 metres from the main access decline into the Irumafimpa orebody, which would provide for easy access should drilling identify a suitable resource for mining. In September 2016, K92 Mining Inc. ("K92") commenced an initial underground diamond drilling program targeting the Judd Vein System to confirm that the system, which was known to run parallel to the Kora deposit, extends as far north as the Irumafimpa deposit. Every hole drilled, covering a strike length of approximately 200 metres, returned significant gold copper and silver results as shown in Table 1 below, confirming that the Judd vein system does extend at least to the Irumafimpa orebody. The proposed exploration drive from the existing Irumafimpa access incline to the known Kora deposit would run parallel to and within 50 to 100 metres of the Judd Vein System. Importantly, Judd is an exploration target and is not part of the K92 mineral resource nor the mining inventory. Ian Stalker, K92 Chief Executive Officer and Director, states, "These high grade results from the first exploration holes drilled at Judd are very positive. While it is significant that the known strike length of Judd has been extended to 2000m with it remaining open along strike, it is also very important to note the high grades of copper and silver alongside the gold in these early exploration results. While our technical team on site continues to focus on the successful ramp up in our production from the Irumafimpa ore body, these exploration results give us increasing confidence in the expansion potential of the mine." The previous drilling results for the Judd vein system were reported in the National Instrument 43-101 Compliant Independent Technical Report, Preliminary Economic Assessment of Irumafimpa and Kora Gold Deposits, Kainantu Project, Papua New Guinea, Nolidan Mineral Consultants, Author Anthony Woodward, BSc Hons., M.Sc., MAIG, with an effective date of November 25, 2016 (the "Technical Report"). A copy of the Technical Report is available for review and has been filed on SEDAR under the Company's profile. Andrew Kohler, BSc, Geo, a qualified person under the meaning of Canadian National Instrument 43-101, has reviewed and is responsible for the technical content of this news release.